Using named day delivery: Order this product within 5 hrs and 6 mins for guaranteed Saturday delivery. 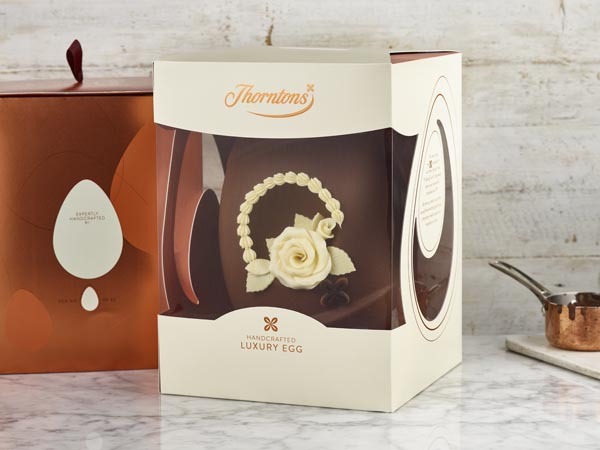 You can still pass the love on this Easter with our entire range of delicious Easter eggs, which each contain the same passion and dedication as our Handcrafted Easter egg. 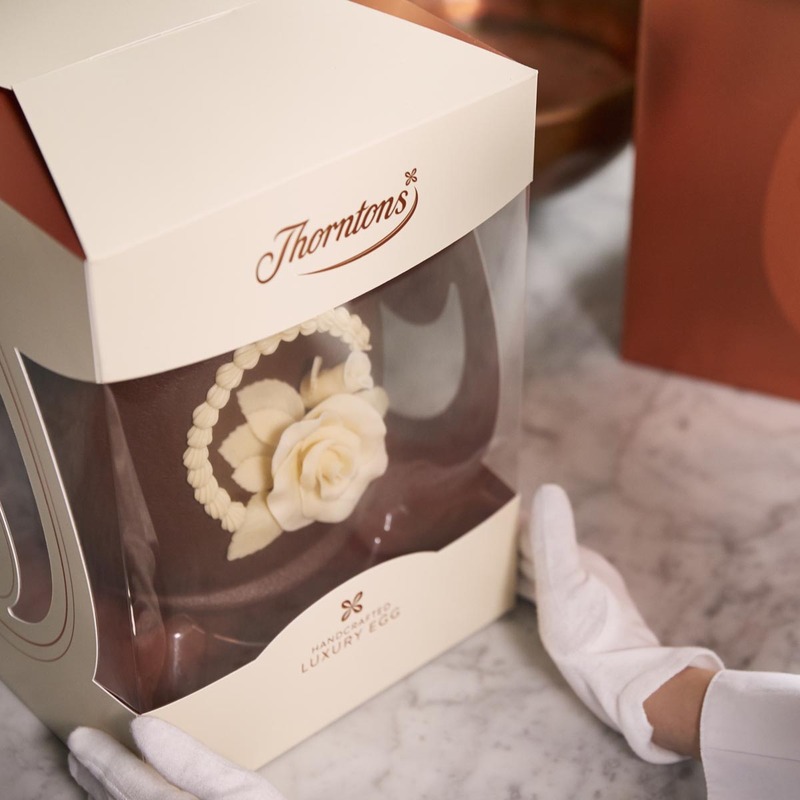 Intricately embellished with chocolate petals, this beautiful Easter gift has been exquisitely crafted by hand. 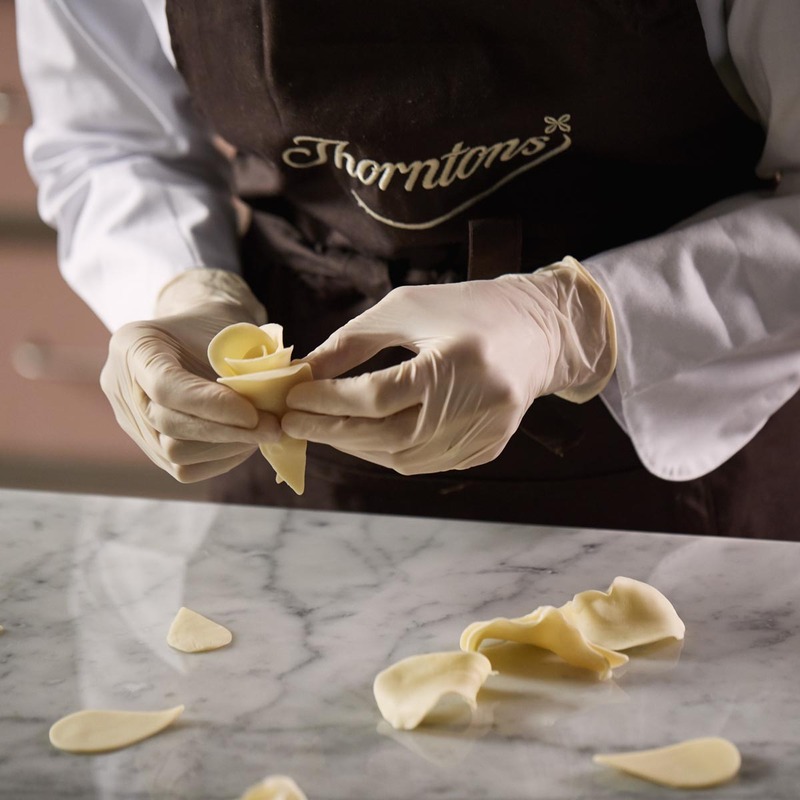 Adorned with a showstopping combination of delicious milk and white chocolate, it’s sure to impress your loved one. 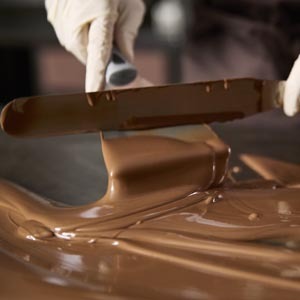 Sugar, dried whole MILK, cocoa butter, cocoa mass, MILK fat, glucose syrup, emulsifier (SOYA lecithin), humectant (glycerol), flavourings, salt, fat reduced cocoa powder. 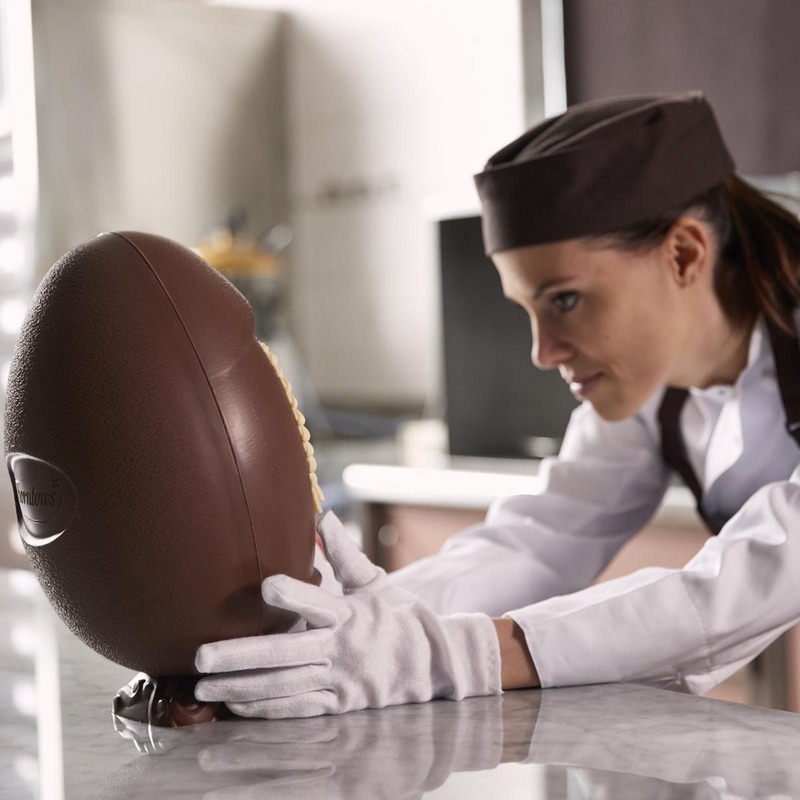 Due to the fragile nature of The Handcrafted Chocolate Easter Egg, we only offer a Named Day delivery service. 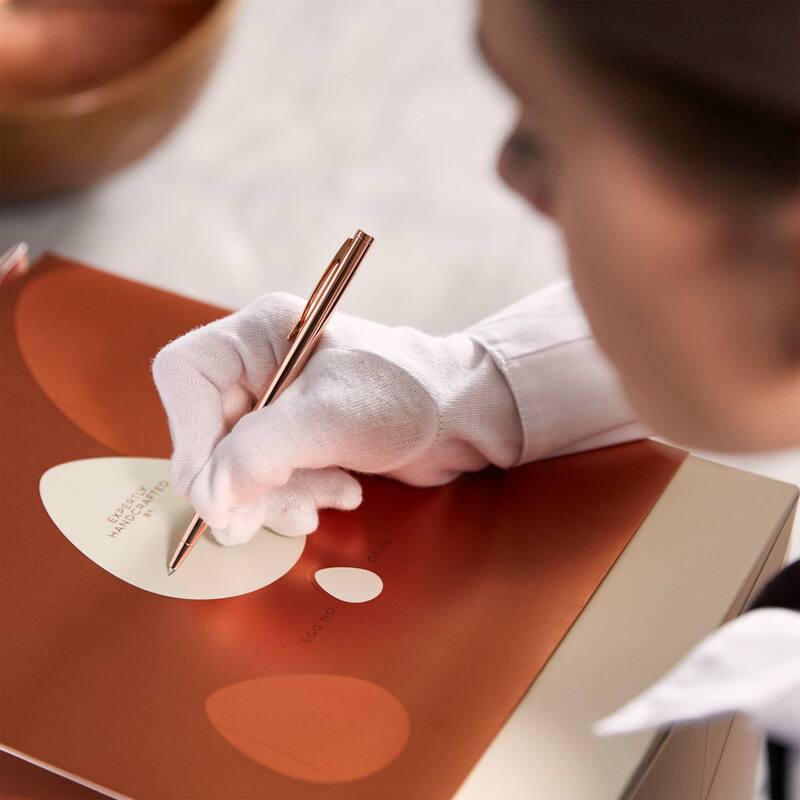 Once purchased, you will be contacted by a member of our Contact Centre team to arrange a suitable delivery date. 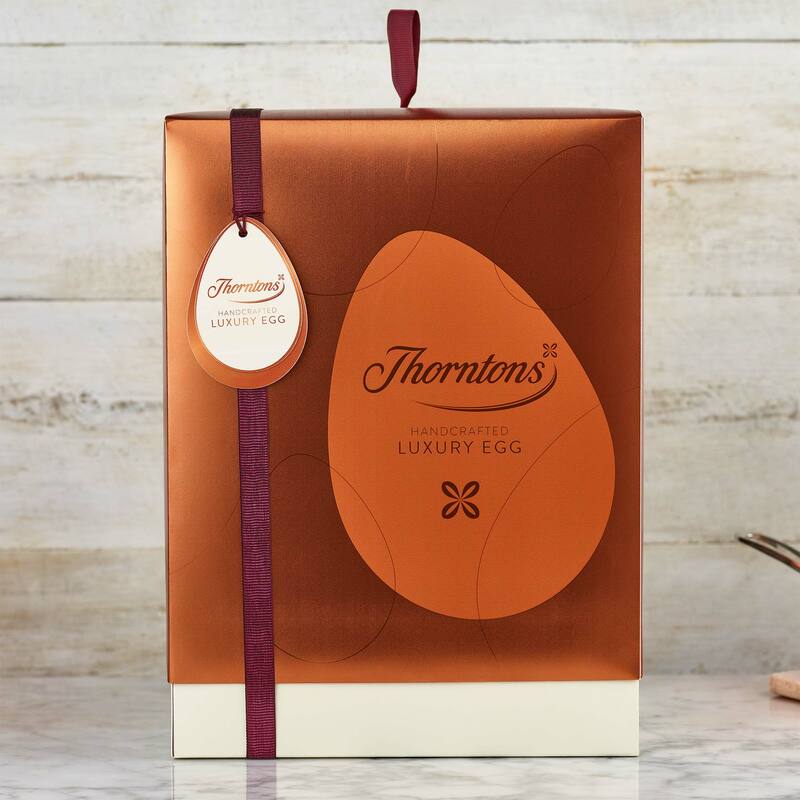 To celebrate Easter this year, we have distilled almost a century of egg-making tradition and expertise into an exclusive batch of exquisite hand-crafted Easter eggs. Easter has always held a special place in the hearts of our expert chocolate makers. 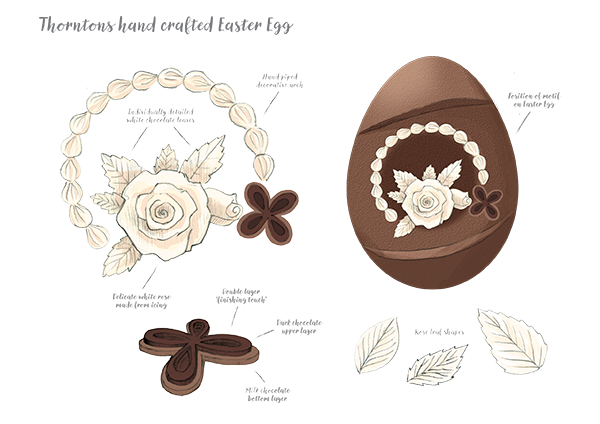 We have been producing delectable Easter eggs for almost a hundred years, always making sure they looked as good as they tasted. 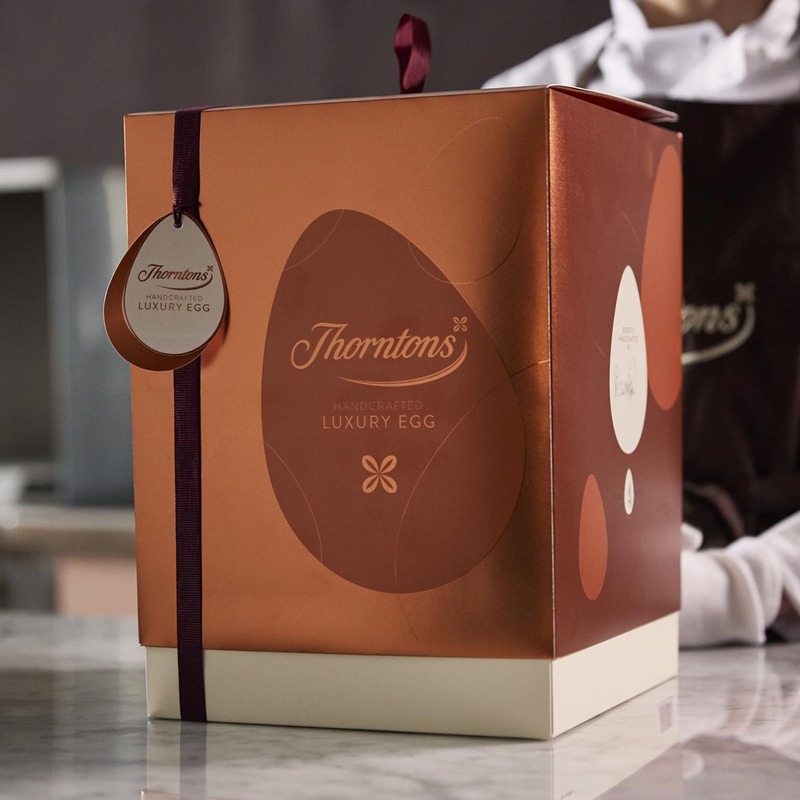 We asked our select team of inspirational and dedicated chocolate makers to develop a signature egg that would showcase their skills and passion, and celebrate Thorntons' tradition of making beautiful eggs. 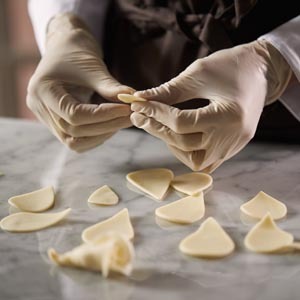 Each of our floral decorations have been carefully crafted by hand. 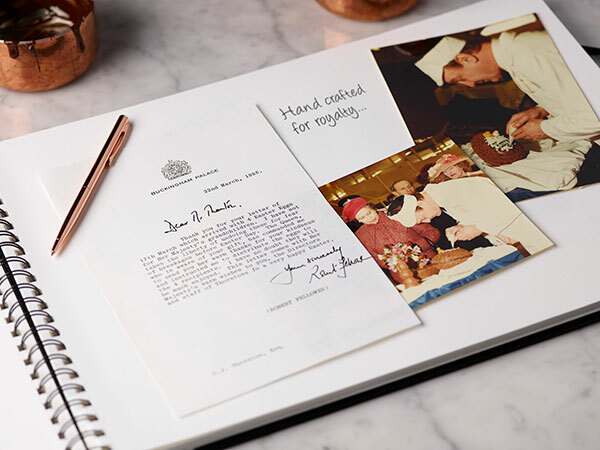 The chocolate makers immersed themselves in our archive of sketchbooks, drawings and notes to draw inspiration from their predecessors and to ensure they captured Thorntons' unique heritage, while adding a contemporary twist. 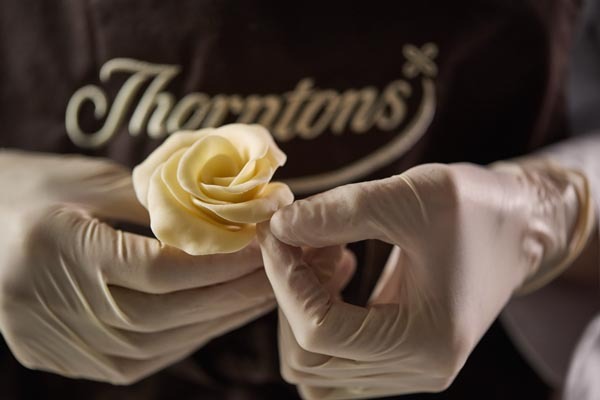 They sketched out a timeless image of a delicate white icing rose, with individually detailed white chocolate leaves and hand-piped decorative arch. The famous Thorntons 'Finishing Touch' would be double layered with dark and milk chocolate. 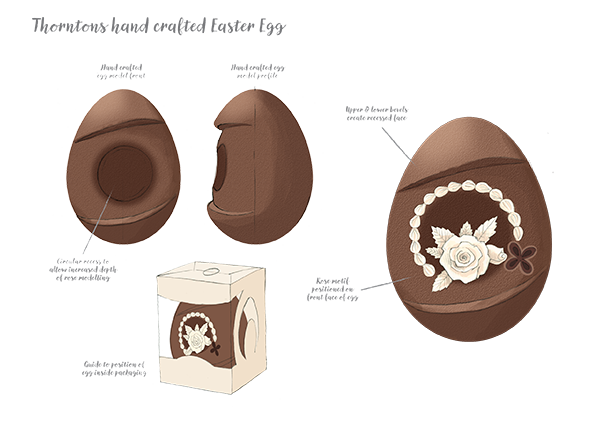 To make the rose even more spectacular, our experts chose to create a recess in the thick milk chocolate egg so the rose could be made in its true shape, standing proud of the egg and finished with exquisite and extraordinary detail. The final design is elegant, captivating and a worthy demonstration of the craft of chocolate making. 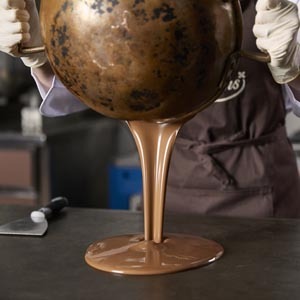 One of our chocolate makers, Veronica, showing one of the beautifully hand finished luxury Easter eggs. The dedication and passion of our chocolate makers also goes into each and every egg we make for you. 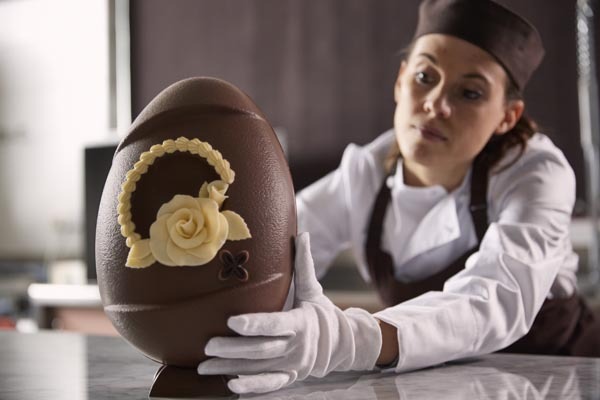 Our range of distinctive eggs are always a treat to look at - and deliciousness comes as standard. 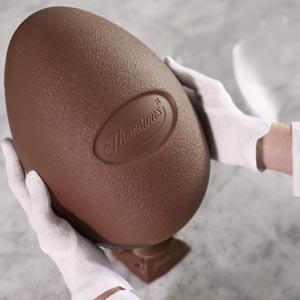 And in our stores up and down the country, chocolate experts continue the tradition of icing names on to our delicious Easter eggs so you can show friends and loved ones just how much you appreciate them. The finished handcrafted luxury Easter egg inside it’s beautiful packaging – One could be yours! 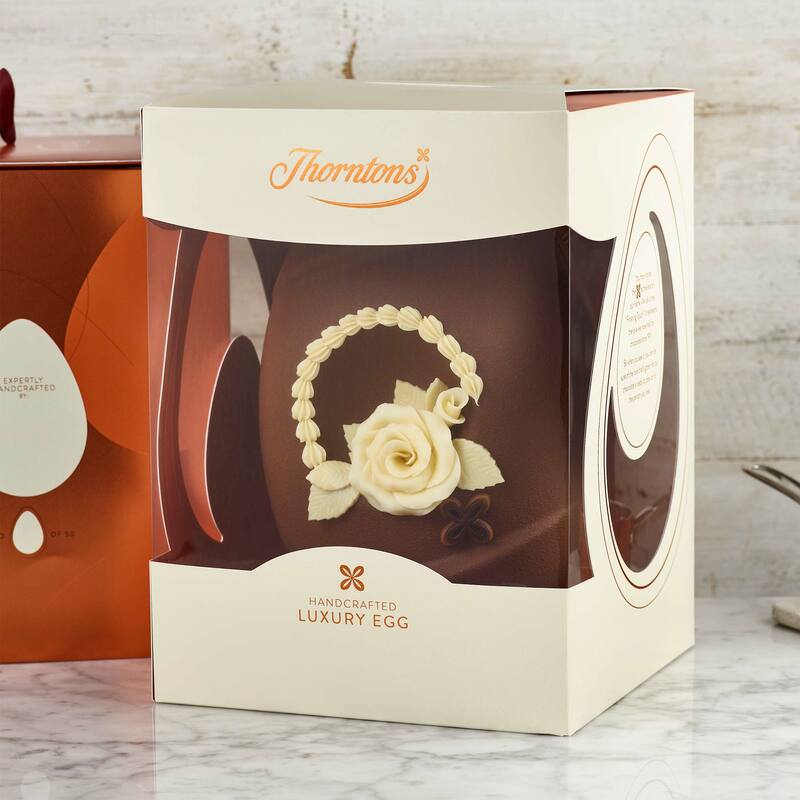 You can buy one of these delightful and delicious eggs, complete with intricate and beautiful hand-crafted rose, in store or online. 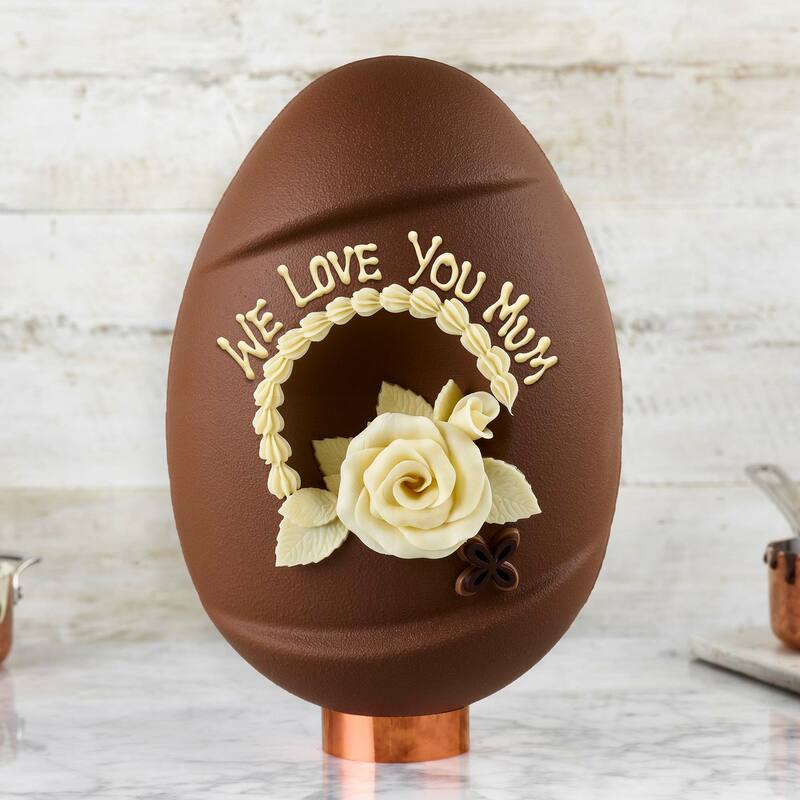 We only have a limited number of eggs for sale so if you would like to buy one and pass the love on, you need to be quick! 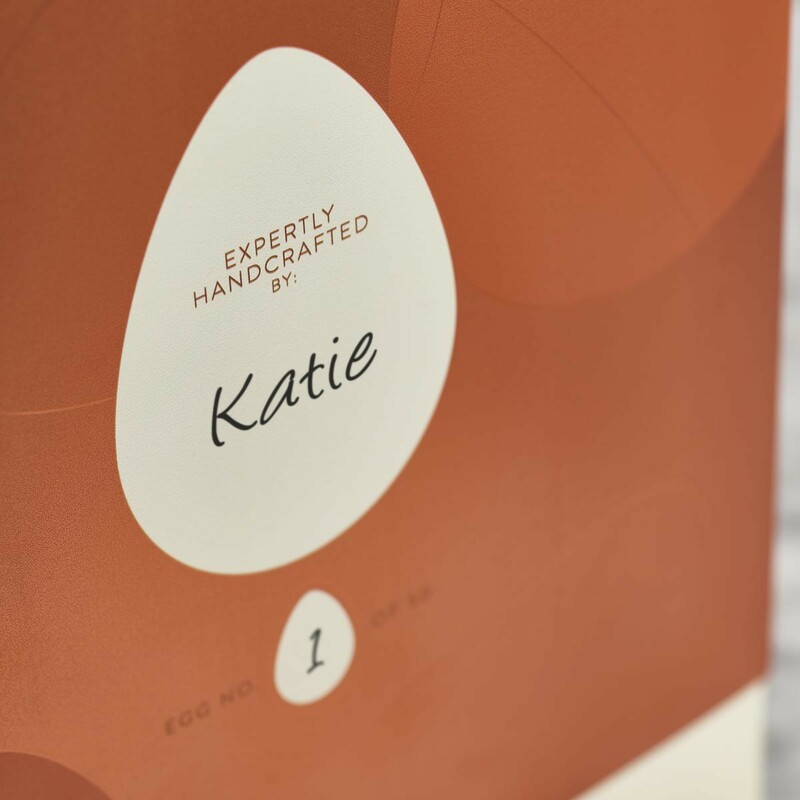 See below for a list of stores the Luxury Handmade egg is available at.